There are several changes which have happened over this week-end, and are causing us to adjust. One adjustment is that ak has travelled to ROME and will be staying there for the next three months, while mmj remains based in the West Country of this Misty Isle. So for the time being we will no longer be meeting face to face, and this is likely to bring about changes in the talking and writing aspects of this blog. and this will effect the walking aspect too. A month ago I discovered that the direct route between the Misty Isle of England and ROME is called the Via Francigena. 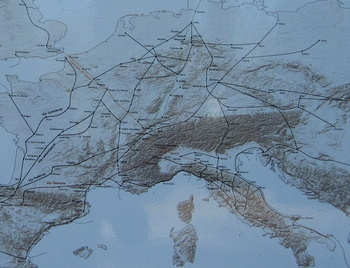 I was in the town of Camaiore, which is near to Pisa in the north of Italy, and outside the town’s old romanesque abadia, I found this map showing the ancient pilgrim routes accross Europe and to Jersualem. I was excited by the revelation of this world-wide-web, but it was also shocking to have been ignorant of these Via for so long. our beloved pooch and walking companion died. 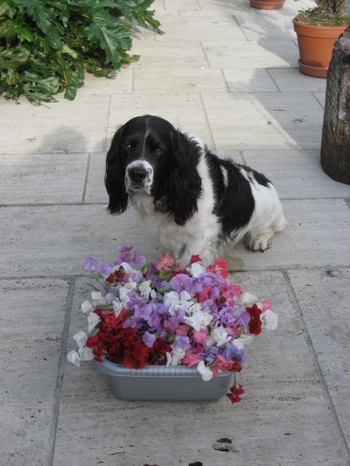 He was 14 years old and had had a good life, but in the last 2 weeks he had suddenly become very breathless. An X-ray by the vet under anaesthetic showed that he had a large cancer in his lung, and the kindest thing was not to revive him but to give him a bigger dose so that he died there and then. We have buried him in a sunny area of the garden. His big dog heart is very much missed. Ignoring the cormorant hanging out to dry. And then from not being hungry, I’m ravenous . . .
– So that’s where angels live! By glimpses though the clouds of the mountains ahead. In the beginning I’m waiting at a bus stop. Maybe I’m thirteen, catching a bus to take me from the suburbs into town. The use of the word ‘beginning’ puzzles me: what do I mean by it? It must mean that there was nothing before the bus stop. I came into existence at the bus stop. Possibly weird, but who can argue with the words as they come. That is, at least until something better comes along. And because things kind of work out I must assume that the bus came along and I stepped on to the open platform at the rear of the Routemaster bus and headed for the stairs. When I watch movies from that period – the fifties – all the actors are smoking an endless supply of cigarettes – it was a world of chain-smokers. These days my nasal passages scream in disgust if I’m around tobacco smoke but back then, in the beginning, there is no memory of the top deck of the bus thick with tobacco smoke. Although I have the idea that smokers went upstairs on the buses: men – all men smoked, and teenagers, and women who smoked in public, though it probably was not quite decent, somewhat risqué for a woman to smoke in public. Actually when I get up there, there’s only two other passengers – and, oh yes I can see them: one, a man in his fifties, thin and bent and should by rights have a roll-your-own ciggie, fixed loosely in his thin lips. He wears a brown raincoat with a checked scarf, hair Brylcreemed severely back. The other is an eighteen year old, his face a nightmare of acne, in a thin navy blue jacket, brown hair with a parting – and I space myself well away from them both. Sit down and stare out the window. It must have been around the time that I tried smoking for the first time. A crowd of us boys in a clump of vandalised woodland, a meeting place. The earth hard packed, the trees all looking malnourished, missing limbs. Cigarettes were lit and passed round. I must have coughed, I remember feeling sick but it had to be done – though I wasn’t in any hurry to repeat the experiment. I also remember hanging around outside the off-licence – though surely they didn’t sell us anything. We might have hoped that the beer could be absorbed by osmosis. There was a lot of hanging about in those days. Waiting for the bus was another sort of hanging out. In fact school had the same feel. Watching the teachers lead their unimaginable lives. To help us get out of all this hanging around we could do one of those exercises found in self-help books. After a suitable relaxation procedure, find your inner bus. What number is it? What colour? What is the destination on the front? And are you going to climb on board?